Rich search results are everywhere. Years ago, search engines presented search results without much adornment. Today, the search results look very different. We see extra information beneath the links, plus a couple of big blocks of rich content, depending on what you look for. The additional lines beneath results are called rich snippets, and they are meant to directly inform users. In this article, we’ll briefly go over the different rich snippets and what they mean for SEO. There are a couple of other enhancements to the search results pages. Rich cards on mobile, for instance, are a sort of follow-up or extension of rich snippets. These provide a lot more actionable information, directly from the search results page. Rich cards were until recently only available for movies and recipes, but have been expanded with local restaurants and online courses. We’ll dive deeper into rich cards at a later date. 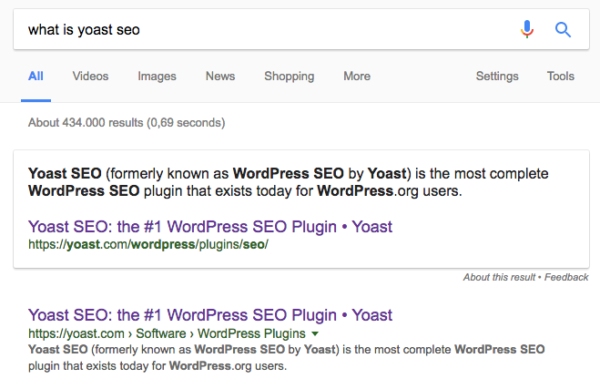 In addition to that, there are also featured snippets. These are the boxes Google shows at the top of the page to answer a query directly. Last but not least, there’s the knowledge graph; this is the big block of information on the right-hand side.